EF6 introduced support for asynchronous query and save using the async and await keywords that were introduced in .NET 4.5. While not all applications may benefit from asynchrony, it can be used to improve client responsiveness and server scalability when handling long-running, network or I/O-bound tasks. The purpose of this walkthrough is to introduce the async concepts in a way that makes it easy to observe the difference between asynchronous and synchronous program execution. This walkthrough is not intended to illustrate any of the key scenarios where async programming provides benefits. Async programming is primarily focused on freeing up the current managed thread (thread running .NET code) to do other work while it waits for an operation that does not require any compute time from a managed thread. For example, whilst the database engine is processing a query there is nothing to be done by .NET code. In client applications (WinForms, WPF, etc.) the current thread can be used to keep the UI responsive while the async operation is performed. In server applications (ASP.NET etc.) the thread can be used to process other incoming requests - this can reduce memory usage and/or increase throughput of the server. In most applications using async will have no noticeable benefits and even could be detrimental. Use tests, profiling and common sense to measure the impact of async in your particular scenario before committing to it. We’ll be using the Code First workflow to create our model and generate the database, however the asynchronous functionality will work with all EF models including those created with the EF Designer. Now that we have an EF model, let's write some code that uses it to perform some data access. This code calls the PerformDatabaseOperations method which saves a new Blog to the database and then retrieves all Blogs from the database and prints them to the Console. 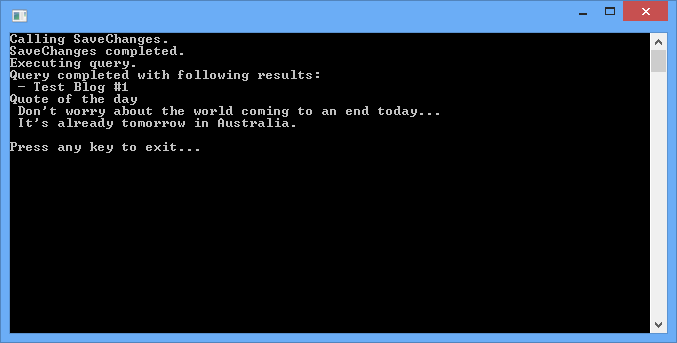 After this, the program writes a quote of the day to the Console. Line 2: The using statement for the System.Data.Entity namespace gives us access to the EF async extension methods. Line 4: The using statement for the System.Threading.Tasks namespace allows us to use the Task type. Line 12 & 18: We are capturing as task that monitors the progress of PerformSomeDatabaseOperations (line 12) and then blocking program execution for this task to complete once all the work for the program is done (line 18). Line 25: We've update PerformSomeDatabaseOperations to be marked as async and return a Task. Line 35: We're now calling the Async version of SaveChanges and awaiting it's completion. Line 42: We're now calling hte Async version of ToList and awaiting on the result. For a comprehensive list of available extension methods in the System.Data.Entity namespace, refer to the QueryableExtensions class. You’ll also need to add “using System.Data.Entity” to your using statements. SaveChanges begins to push the new Blog to the database Once the command is sent to the database no more compute time is needed on the current managed thread. The PerformDatabaseOperations method returns (even though it hasn't finished executing) and program flow in the Main method continues. Quote of the day is written to Console Since there is no more work to do in the Main method, the managed thread is blocked on the Wait call until the database operation completes. Once it completes, the remainder of our PerformDatabaseOperations will be executed. Query for all Blogs is sent to the database Again, the managed thread is free to do other work while the query is processed in the database. Since all other execution has completed, the thread will just halt on the Wait call though. We now saw how easy it is to make use of EF’s asynchronous methods. Although the advantages of async may not be very apparent with a simple console app, these same strategies can be applied in situations where long-running or network-bound activities might otherwise block the application, or cause a large number of threads to increase the memory footprint.